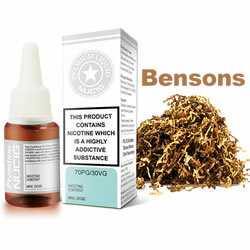 Try our Blue Label Bensons ( aka Gold & Silver) eliquid flavour, it is a perfect blend for the perfect vaping experience. 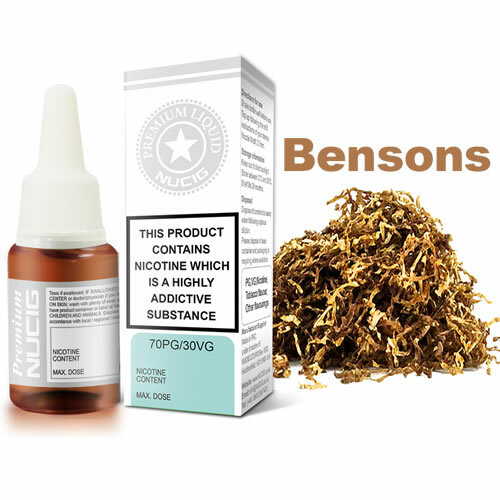 NUCIG Blue Label rolled virginia leaf eliquid contains only the purest and highest quality pharmaceutical grade ingredients and is for those who prefer extra throat 'hit' and 'kick'. Exclusive MaxVol™ technology delivers a smoother, richer maximum volume smoke (vapor), providing a satisfying rich deep ripened tobacco flavour. Specially formulated to extend the life of your electric cigarette atomiser, clearomiser and tank. This liquid is the reason I no longer smoke cigarettes and I am so glad they are still going after all the governments pressuring the whole of the cigarettes. Thank you nucig thank you so much for just being there. These really are not as good as the old 20 ml bottles. They are more difficult to use. Also with the old 20 ml bottles did not need to carry round spares.